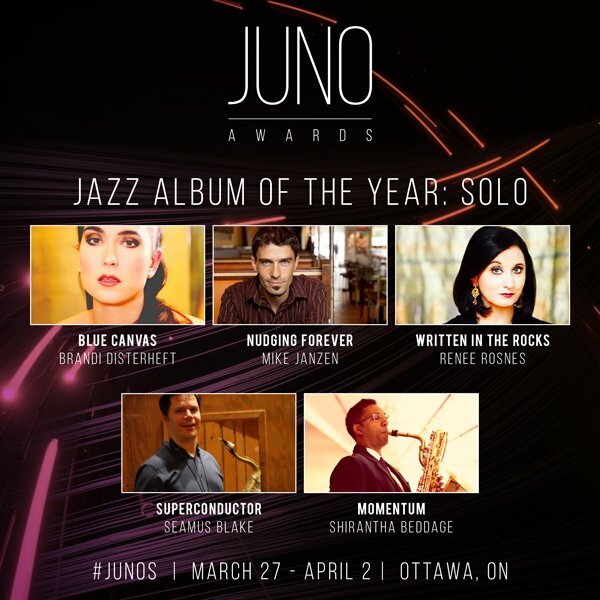 Momentum is nominated for Jazz Album of the Year (Solo) at this year’s JUNO Awards! I’m thrilled to be in the same category with pianists Mike Janzen and Renee Rosnes, tenor titan Seamus Blake, and my old friend Brandi Disterheft. I am also one of the musicians on the Order of Canada band album, Sweet Canadiana, which was nominated for Jazz Album of the Year (Group). This album features a whole host of Canadian artists including Don Thompson, Phil Dwyer, Terry Clarke and Dave Young. It was fun to share the moment at yesterday’s nomination with my friends and colleagues Ernesto Cervini and Dan Fortin (Orange Grove Publicity – thanks for all you do, guys! ), David Braid (Instrumental Album of the Year nominee), Mike Murley (Jazz Album of the Year Group nominee), Heather Bambrick and Amanda Tosoff (nominated in the Vocal category). Hope to see some of you in Ottawa in April! In the meantime here’s a brand new video from our Toronto CD release concert, featuring Robi Botos, Mike Downes and Will Kennedy. Hope this Pork Chop is cooked to your liking!